Reed Gunther at Long Beach Comic Con! After taking some time off this year to work on some animation projects, Shane and Chris will be returning to the So-Cal area for some comic con appearances! 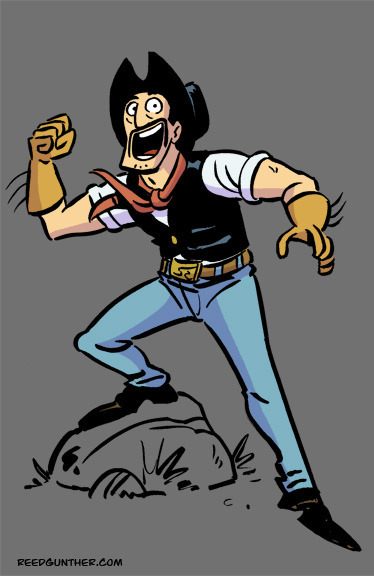 Join us at the Long Beach Convention Center on November 23rd and 24th for a weekend of comics, sketches, and stories! Ask us about the Reed Gunther Amazon pilot! Check out the books we’ve been working on this past year, such as FANBOYS VS. ZOMBIES, BART SIMPSON, SIMPSONS ONE-SHOT WONDERS, ADVENTURE TIME, and more! 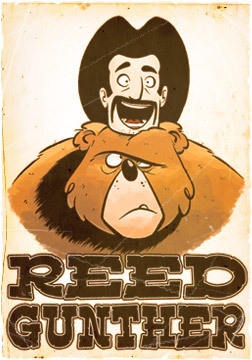 Have Chris draw you a custom sketch of one of your favorite characters… like Reed Gunther! It’s the con’s fifth year anniversary so there’s tons of special guests, panels, and exhibitors this year. 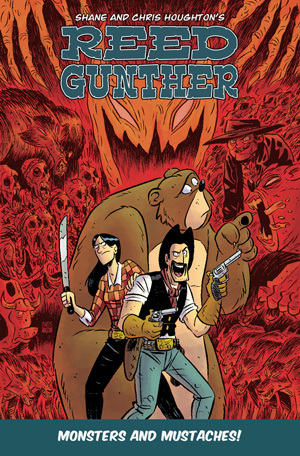 And if you swing by the Reed Gunther booth, we’ll even give you a free comic! Hot Dog – What a deal! San Diego Comic Con 2012! REED GUNTHER will once again be at the San Diego Comic Con International! Chris and I will be stationed at the Image Comics booth (#2729), which is located right in the very center of the convention floor. Come find us and hang out! We will have ADVANCE copies of the second RG trade paperback on hand, but they are limited so get there early! MONSTERS AND MUSTACHES will be officially released July 25! 3:00-4:00 Peanuts: The New Comic Book Series (Room 32AB) — Discover the origins behind KaBOOM!’s new Peanuts comic book series. The creative talent behind the new adaptations of Charles M. Schulz’s classic comic strip offer an in-depth look at how the project began, the challenges of adapting the comic strip master, and the exciting new places Charlie Brown and Co. are going next. Participants include Paige Braddock (Jane’s World, The Martian Confederacy), Alexis E. Fajardo (Kid Beowulf), Shane Houghton (Reed Gunther), Vicki Scott (Happiness Is a Warm Blanket), Adam Staffaroni (BOOM! Studios), Justin Thompson (Mythtickle), and Matt Whitlock (Family Guy). 1:00-2:00 All-Ages Comics: A New Hope (Room 24ABC)— A surge of successful all-ages comics are hitting the scene, and the demand just keeps growing. Roger Langridge (Snarked, Popeye), Chris Houghton (Reed Gunther), Shane Houghton (Reed Gunther, Peanuts), Matt Whitlock (Peanuts), and others discuss the role of all-ages comics in the industry, their power in developing new readers, and what it takes to make a comic book that children and adults will both enjoy. 3:00-4:00 Creating Comics for All Ages (Room 4)— Victor Flores (High Tech High Graphic Novel Project student host) interviews fellow HTH GNP members and guest professional comic artists Shane Houghton (Reed Gunther, Peanuts, Casper’s Scare School) and Chris Houghton (Reed Gunther, Kung-Fu Panda Comics, MAD magazine, Adventure Time) about the challenges and advantages of creating comics for all-ages audiences. Hope to see you there! Have a super fun convention!